Now I do have a sweet tooth and I do love normal Mars bars, so of course, I HAD to try the new Mars Caramel. 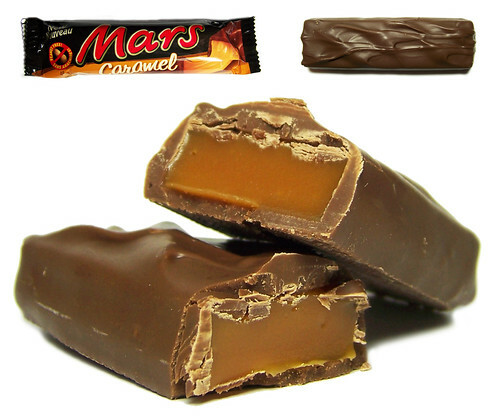 The Mars caramel is the same size as a regular Mars, but instead of having the nougat with a thin layer of caramel on top, they have taken out the nougat and the entire bar is just thick, gooey caramel (with the usual chocolate coating). I love these - although I must admit, that much caramel does border on too much of a good thing. I really like these and I cant wait to have another. Maybe I will put the next one in the freezer for awhile to harden the caramel. I still prefer the Mars Midnight (does anyone remember those? ), but this is another super yummy spin off of regular Mars.